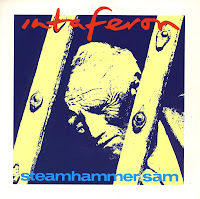 Intaferon was a short-lived Eighties band, consisting of Simon Fellowes and Simon Gillham. Their only claim to fame was this 1983 single, 'Steamhammer Sam', which failed to reach the UK singles chart but did reach number 36 in the Dutch Top 40 that year. Their song 'Get out of London' was featured in the 2001 Mary-Kate and Ashley Olsen movie 'Winning London'. Their singles were often featured on the Channel Four television show 'Max Headroom'.